It’s happening now. It’s happening again. Endless cycles are a motif that runs deep throughout The Wicked + The Divine, from the unending dysfunction and madness of the Pantheon, to the circle that makes up their logo and meeting table, to the very nature of their perpetual rise and fall, a neverending cycle of death and rebirth. In fact — if anything she’s said can ever be believed — one of Ananke’s greatest fears seemed to be the idea that this cycle could somehow be broken. 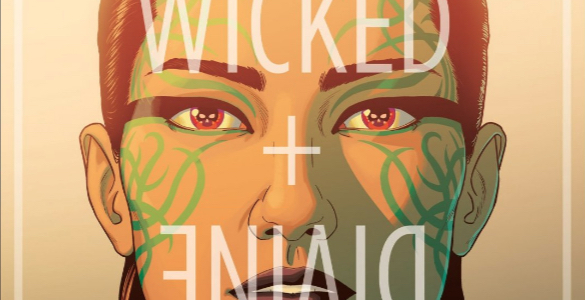 These are both ideas that Kieron Gillen, Jamie McKelvie, Matthew Wilson, and Clayton Cowles dig into in The Wicked + The Divine 36, an issue that spends a shocking amount of space detailing yet another endless cycle, and the rest of the issue breaking an entirely different one. The issue opens on a scene that recalls the infamous climax of issue 11: Ananke approaching an incarnation of Persephone, encouraging her to sing, before brutally murdering her. The creative team then spends the next eleven pages replaying that moment over and over, depicting 65 different meetings between Ananke and Persephone over the course of more than 5800 years. This sequence is full of subtle, well-researched detail, but what interests me most about it is the way Ananke and Persephone’s encounter evolves over time. Although Ananke murders Persephone probably 75% of the time, it’s not a foregone conclusion — there are numerous instances where Persephone manages to fight back, kill Ananke, or even flee the scene, and for her part, Ananke quickly learns to defend against Persephone’s attacks. In some situations, often after Persephone has managed to instead kill Ananke, they even embrace. While details still aren’t 100% clear, what this confirms is that Ananke isn’t immortal in the sense that she can’t die — she’s immortal in the sense that she will continually be reborn, regain her memories, and get back to her old tricks. Nothing stops her, not even centuries of peace. That’s discouraging, because I always thought Laura-as-Persephone would be the one to break the cycle. I thought that’s what happened when she murdered Ananke, I even assumed that her being the Destroyer would involve her breaking down and destroying many of the traditions surrounding the Pantheon. Instead, though, she’s just as ensnared in them as Ananke was. Turns out, what’s special about Laura’s particular situation is her friends. She’s saved from Ananke by Inanna and Baphomet, and it’s the only encounter in all those eleven pages where anyone outside of Ananke and Persephone appears. They’ve already broken a cycle, in their own way. And that brings us to the present day, where Baal reveals to Laura his own vicious cycle of child sacrifices, one every four months, to stave off the Great Darkness. Unlike the first half of the issue, Gillen and McKelvie choose to conceal rather than detail here. This goes on for three more pages, each one a gut-punch, each one more painful than the last because they just keep coming. What stops Baal is the revelation that Laura is pregnant — even though the baby might not be his, it’s enough to turn Baal’s stomach to his whole endeavor, leading him to burn down Valhalla (something Laura admits that she always thought she’d do). This alone can’t redeem him, but it does show that anyone has the power to break the vicious cycles they find themselves caught in, if they have the right motivation. Laura certainly can’t do it all alone. If Jamie McKelvie ever murders Kieron Gillen, this comic could be used as evidence of justifiable homicide. The sheer amount of effort made by McKelvie to design so, so many different variations of the same characters, for only the one panel. And the research time. 130 different characters needed to be designed. But wow, this is a breathtaking issue from an art level. 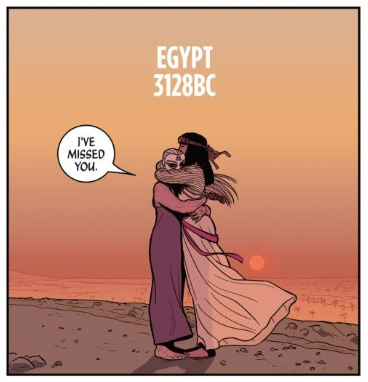 Between the totality of Ananke’s crimes be g displayed in a marvel of visual storytelling (I’m pretty sure the hugs are the hugs that happen just after Ananke chooses. They aren’t signs of positive resolutions, just mysterious about what happened next). I love some of the subtler storytelling, like how there was a period where Ananke was struggling with the kill enough times she had to learn how to make a shield, until she managed to return to a stable equilibrium. Though honestly, my favourite part of the art is the second half. 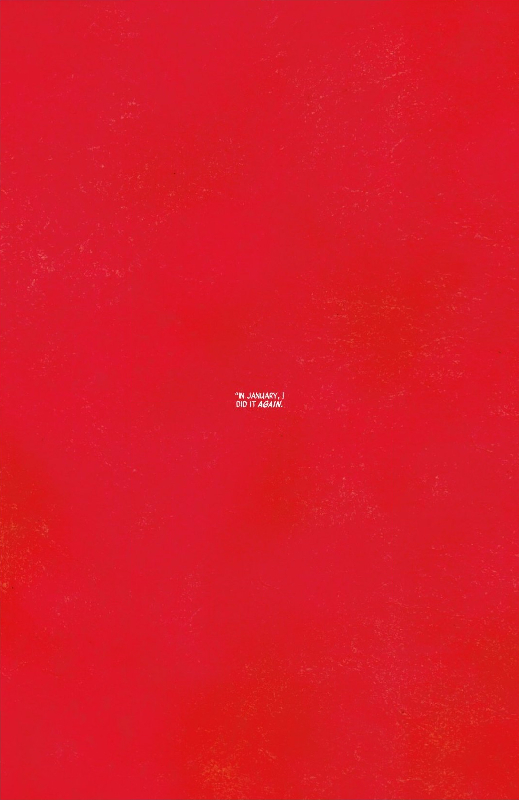 The colours are overwhelming red, as they should be, as we are all lost in the horror of Baal. And when the page becomes nothing but red, with just a little text, the all consuming nature of Baal’s horror cannot be ignored. The combination of lack of art and colouring creates an incredibly powerful effect that would be ruined with more art. Just as we were forced to comprehend the totality of Ananke’s crimes, the red pages force us to consider the specificity of each of Baal’s. Every kid is given a spotlight so that we truly feel it. Also, I bet that the reveal of Laura’s pregnancy in an issue about child sacrifice isn’t a coincidence. Not just contrasting life and death. Ananke said their needed to be a sacrifice of A Child. I think that means a specific child and I think that means something bad for Laura’s child. What do you mean by the gods enslaved by rules of myth? Each of the gods have been changed from ordinary people to mythic archetypes. The way the inspire is essentially as a recurring story narrative that is repeated each time. Despite the fact that Lucifer never rebelled against heaven and is just a normal british teenager, she in every way that matteres rebelled against heaven as that is the story. Their powers, their personalities are defined entirely by the story they are put in place of. And even outside of that, they are trapped by, essentially, being creatures of story. Of art. That’s why they looks like pop stars, as they are reflections of the current pop zietgeist. Just as previous pantheons re enacted Frankenstein.